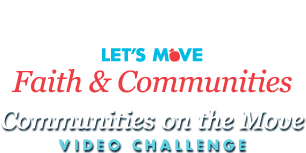 The submission deadline for the Communities on the Move Video Challenge is THIS FRIDAY, April 6 at 5 p.m. EDT! Do you have all the required items ready to go? Make sure your entry is complete, triple check the Submission Checklist below. We don't want to have to disqualify your video based on a technicality, no matter how small it may seem! The competition is open to faith-based institutions, community-based institutions and other non-profit organizations that, at the time of entry, are domiciled and organized in the United States. Government and for-profit entities, individuals, and teams of individuals are not eligible. Still not sure? See "Who is eligible to enter the competition?" in the FAQ for details. Good luck — we look forward to seeing your inspiring videos!